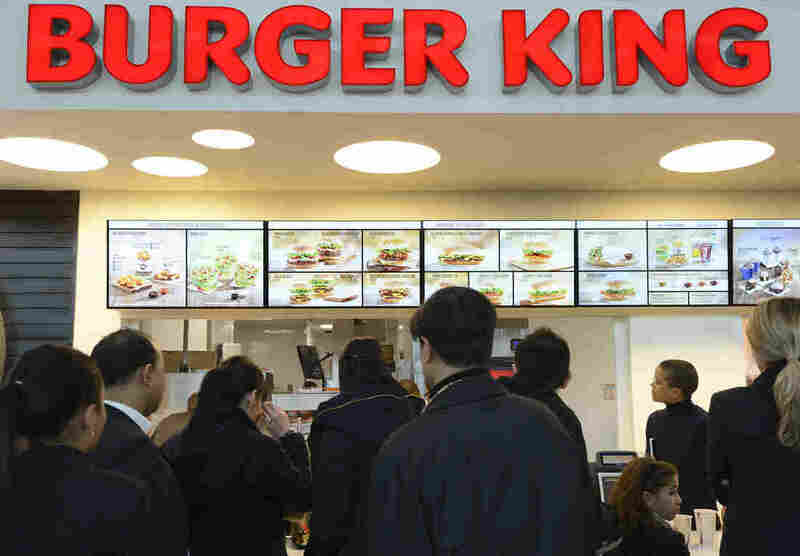 OK Google, Burger King Hijacked Your Speakers ... And Failed Pretty Quickly : The Two-Way The fast-food chain launched an ad Wednesday meant to wake viewers' Google Home speakers and use them for a makeshift promo. Sadly for Burger King, it wasn't long before the ploy hit some speed bumps. Yet for a while Wednesday, those are precisely the ingredients — according to Business Insider and The Verge, at least — that the fast-food chain's new commercial accidentally directed viewers to check out. The pitchman in Burger King's brief advertisement played off that brevity by noting he just didn't have enough time to list all "the fresh ingredients in the Whopper sandwich" — so instead, he simply pulled the camera near and closed with a question addressed to the viewers' home devices: "OK Google, what is the Whopper burger?" The idea was that if the search company's smart speaker (and possibly future sentient overlord) Google Home happened to be listening nearby, it would then answer the question with a makeshift promo for the burger — an explanation of Burger King's signature item. ... for a little while, that is. You see, two problems cropped up pretty quickly. First off, Business Insider notes the ad sent Google Homes directly to Wikipedia, which — as high school syllabuses across the country will warn you — is not always a reliable source of accurate information. Enterprising trolls all but immediately took to the Whopper page to make some rather clever (if dubious) edits. Also, according to Gizmodo, this short-lived description: "The 'Whopper' is the worst hamburger product sold by the international fast-food restaurant chain Burger King." "The Whopper is a burger, consisting of a flame-grilled patty made with 100% medium-sized child with no preservatives or fillers, topped with sliced tomatoes, onions, lettuce, pickles, ketchup, and mayonnaise, served on a sesame-seed bun." Soon the company caught wind of the mischief and locked the page with a neutral definition, Gizmodo says. Then there was another problem: The New York Times reports that Burger King didn't consult Google on the campaign ahead of time. Within hours, the tech company put a stop to the central shtick of the ad, changing its device so that Burger King's question — as it is uttered in the commercial — would no longer wake it. "What we have learnt about Google Home, at least, is that the internet group does know how to switch off a particular voice trigger when it wants to, probably by checking an audio 'fingerprint' against a blacklist in the cloud before allowing a response." This may pose further problems for the commercial, which Business Insider says is running on at least a half-dozen channels in several major cities. At any rate, the commercial's ploy and its deactivation nabbed Burger King some attention and served as a reminder for us all: It might be that eventually the real achievement isn't the fact our devices talk to one another — as they briefly did in this case — but rather that we can still get them to shut up at all.